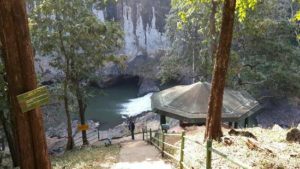 Syntheri Rocks – Located 32 km from the Resort, Syntheri Rock is monolithic granite structure having a height of 300 ft, which is located in the dense forest of Dandeli, The River Kaneri that flows at this place passes along the side of this rock. Owing to the flow of the river from the vicinity, erosion has resulted in the rocks getting hollowed. The corners of this rock cave are inhabited by numerous pigeons.Hives of rock bees can be seen hanging from the nearby locations. The site can be reached either by jeep or by walking through the dense forest. 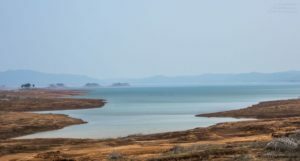 Backwater – The beautiful backwaters of the Supa Dam and Kali Nadi are an ideal setting for a beautiful sunset. Located just a few kms away from the Resort, the Backwaters are a picturesque location even for ideal pictures and photographs. You can spend a nice evening here, with snacks packed from the Resort. Handi Badanganath Temple – This is the temple of Lord Bhairavanathji, visited a lot by locals. The myth of this temple is that when Guru of Badaganathji was upset with him, he had fixed pot on his head and this pot (handi) broke off from his head after 12 long years, at this spot and hence the place got its name as handi badaganath. A beautiful place surrounded with the Sahyadri ghats, and Sadhus living here, open to interact with tourists. 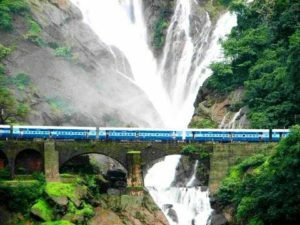 Dudhsagar Waterfalls – Dudhsagar Falls (literally Sea of Milk ) is a tiered waterfall located on the Mandovi River on the border of Karnataka and Goa. Surrounded by a deciduous forest and different species of animals and birds abound this area. We conduct day and overnight camps near the bottom of the Dudhsagar waterfalls, at our campsite – Bison Jungle camp at Kuveshi.